We at ToXSL Technologies take our festivals very seriously. We adore and enjoy the festivities, the scrumptious food, and the traditions. We rang in the festive season of 2018 by celebrating Navratri each day by dressing up in vibrant and colorful clothes dedicated to each day. And now as these nine days lead to Dussehra, the victory of good over evil, we are all set to celebrate it with a bang too. The celebrations began with a traditional puja at our office followed by an aarti. The puja set the tone for the day and created a pious and a festive atmosphere. As a part of the celebrations, the office was decorated beautifully. Employees contributed completely to decorate the office. No auspicious day is complete without a rangoli and ToXSLians made sure their office looked ready for a celebration. The bright colors and enticing patterns created an auspicious and festive atmosphere. The event started with some fun games conducted by the HR department. Following that, new joiners were introduced with a new style. 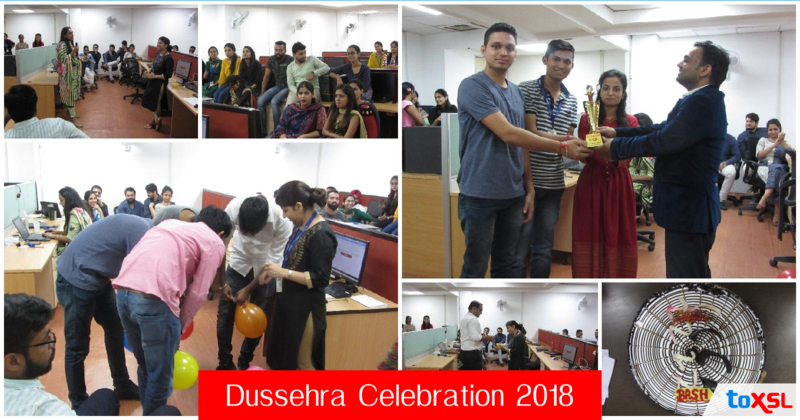 The quarterly prize distribution ceremony was also held in which Gitanjali, Mayank, and Gagandeep of the IT department won the prize of the best team. Finally, employees put on their dancing shoes and grooved to some traditional music. The day ended with some snacks and sweets to make employees all refreshed and geared for the new challenges.